Fantasy Football comes in many different shapes and forms. From season-long leagues to weekly leagues, there is something for everyone who wants to get more out of their football fandom. Following is a list of ten different sites on which to play fantasy football. Most host sites require little more than signing up for an online account to begin playing, so pick which format is best for you, grab your friends, and have some fun. 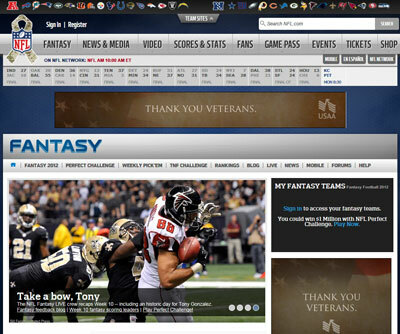 Offering one of the first mainstream free fantasy football services, Yahoo! has been a pillar of fantasy sports and will be for a long time. Its easy-to-use interface, real-time stat tracking, and in-house fantasy analysis has many a fan coming back season after season. ESPN is synonymous with American sports, so it only makes sense that they would offer a stellar fantasy service. Offering an all-inclusive analysis across a wide variety of media including web content, podcasts, and a Sunday morning fantasy-specific pre-game show, ESPN is a one-stop fantasy football site. The NFL has done a lot to embrace fantasy sports as a key component to the league’s popularity — everything from mandating that fantasy stats be shown in stadiums to hosting the official fantasy football service of the NFL. And if you are a DirecTV subscriber, there are a lot of nice features that this site has integrated into their satellite television service. Hosting one of the more detail-intense fantasy football services, CBS is a place where fantasy players of all skill levels can make a home. Besides fantasy football, CBS is a friend to many types of fantasy sports. Although lesser known than some of the other major names in the game, Fleaflicker offers a clean, easy-to-navigate interface and a lot of nice features in a fast, stable platform. Fox Sports is another TV network that is committed to the advancement of fantasy sports. Fox Sports offers a detail-rich fantasy service with a lot of online content to get lost in after you set your fantasy lineup. Another lesser known fantasy host site, My Fantasy League is a pay service that boasts an incredible amount of league and interface customization. This site is the winner of many industry awards. Advanced players may want to make the investment to take their fantasy football skills to the next level. If playing for a full season commitment is not in the cards for you, Fan Duel offers weekly leagues in both free and buy in/cash prize formats. It’s easy to sign up and navigate Fan Duel, which offers a service to both the casual and experienced fantasy player without the long-term time commitment. Similar to Fan Duel, ESPN Sub Games offers other games to test your football knowledge without the major commitment of season-long fantasy football. Games like Pigskin Pick’em, Eliminator Challenge, and even some college football games, give the fantasy player other options than the traditional fantasy football league. Fantasy Football can trace its roots back to the 1960s. Old-school players would meet for a draft and follow weekly stats with a pencil, a calculator, and the newspaper’s sports page. Have a fresh new idea or different spin on an old format? Set up your own league, with your own rules, and find the mix of pencil and paper and electronic stat tracking that works for you.